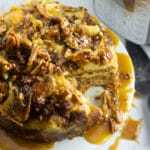 This Instant Pot Bread Pudding with Pecan Caramel Glaze is perfect to make in your Instant Pot. 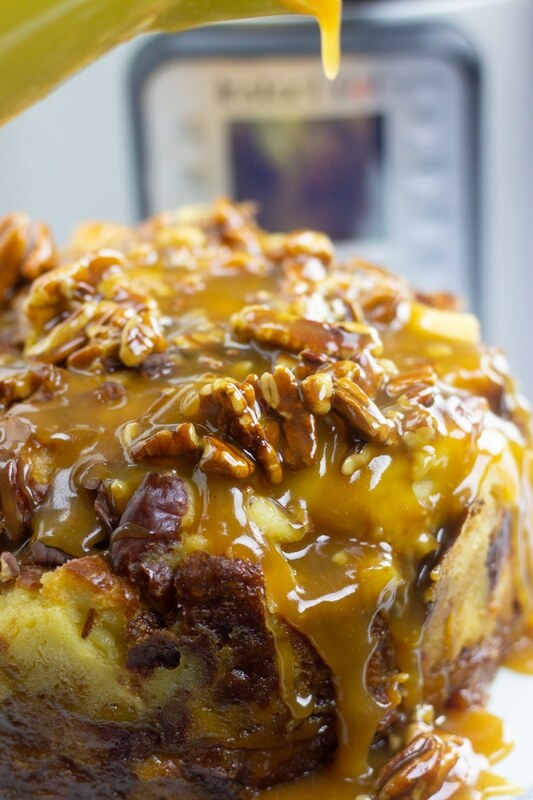 The bread pudding stays moist and delicious and is topped with a sweet and nutty pecan caramel glaze. Is bread pudding a breakfast or dessert, that is the question! Well I say both! 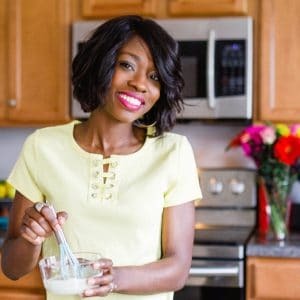 This recipe came about because I really wanted to make dessert in my Instant Pot. I had already made this New York Cheesecake, my Carrot Cake Cheesecake, and now I wanted to try pecan pie in the Instant Pot Pressure Cooker. So one night, I went to experimenting….and after I made the batter for my pecan pie and put it in the Instant Pot, I fell asleep. First, let me say that I do not recommend falling asleep while doing any form of cooking. Secondly, let me say that I am so glad that I was baking in my Instant Pot rather than any other device. I woke up and found that my Instant Pot had been natural releasing for 7 hours…but my home and my family were ok. I dumped that pie out and decided to try for another day. A few days later, I noticed I still had a ton of pecans in the pantry but I now was craving bread pudding. So it dawned on me, combine both desserts and live my best life. So I did, it was amazing, and I am sharing the recipe. This bread pudding has about 3 seperate layers, the bread pudding, a pecan pie glaze, and a caramel pecan glaze on top. First, you whisk together milk, heavy cream, lightly beaten eggs, sugar, vanilla extract, and melted butter in a medium bowl. Set aside. Then grab a larger bowl and break a loaf of challah bread into 2 inch pieces. If you can’t find Challah, Brioche or even Texas Toast would be a fine substitute. Pour the milk mixture over the pieces of bread and softly toss, ensuring that all of the pieces of the bread are covered. Set aside and allow the bread to soak up all of the milk mixture for at least 1 hour. Some people soak bread pudding over night, an hour is good enough for this recipe. 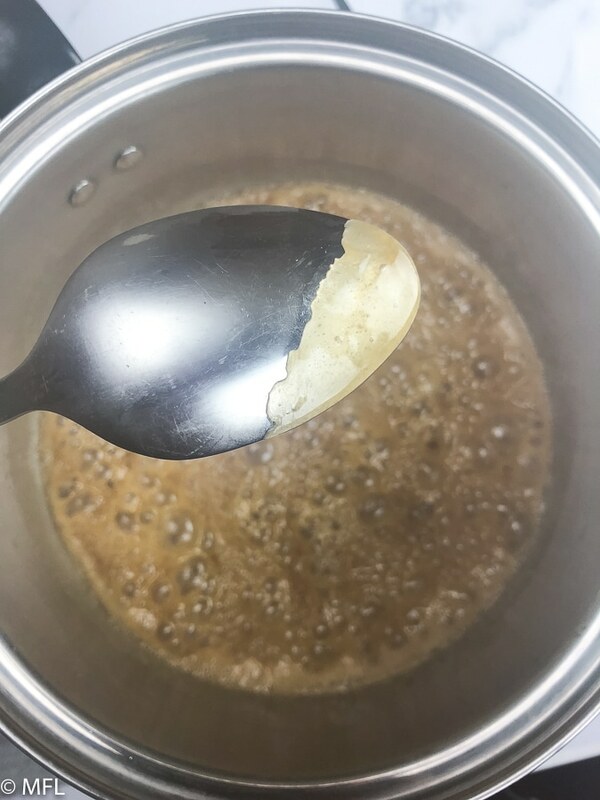 When there is about 10 minutes left of soaking, whisk together dark corn syrup, lightly beaten eggs, brown sugar, melted butter, vanilla extract in a bowl. Toss in chopped pecans into this mixture. When ready, grab a 7 inch pan (I used the bottom of this Instant Pot Steamer Insert) and grease all sides with butter. 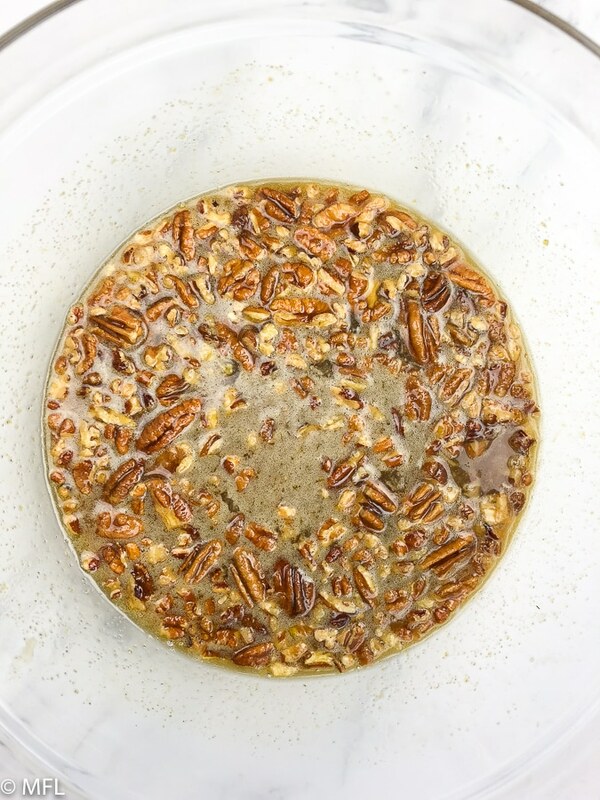 Add a layer of soaked bread on the bottom, then add about ½ cup of the pecan glaze mixture, then more bread, and continue until the top layer is a layer of pecan glaze. Lightly cover pan with foil and place in Instant Pot. My steamer basket comes with an insert that makes it easy to place the pan into the Instant Pot and easy to take it out. If you don’t have a pan, you could always create a foil sling to place the pan in the pot. Or you could use this oxo bakeware sling. Cover and cook on high pressure for 30 minutes, with a natural release of 15 minutes, and then manually release the remaining pressure. 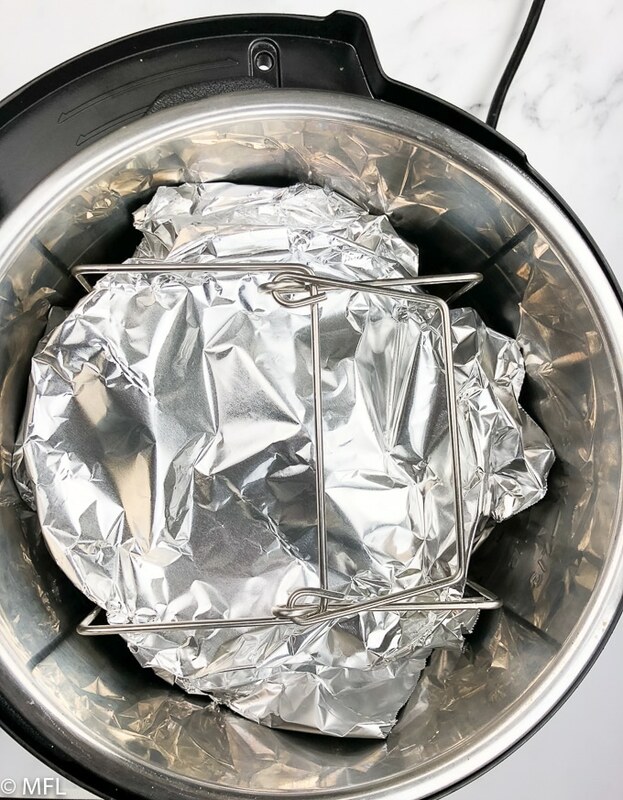 Once done, open Instant Pot and remove bread pudding and foil. It should look like this. Meanwhile, create your top layer, pecan caramel glaze, by placing a heavy bottom saucepan over medium high heat. Whisk together butter, corn syrup, sugar, heavy cream, and a pinch of salt. Allow mixture to come to boil and reduce heat to medium. Allow mixture to cook for 5-7 minutes, stirring occasionally. Test your glaze to see if it coats the back of a spoon. If it does, it’s done and you can remove from the heat. Stir in chopped pecans. 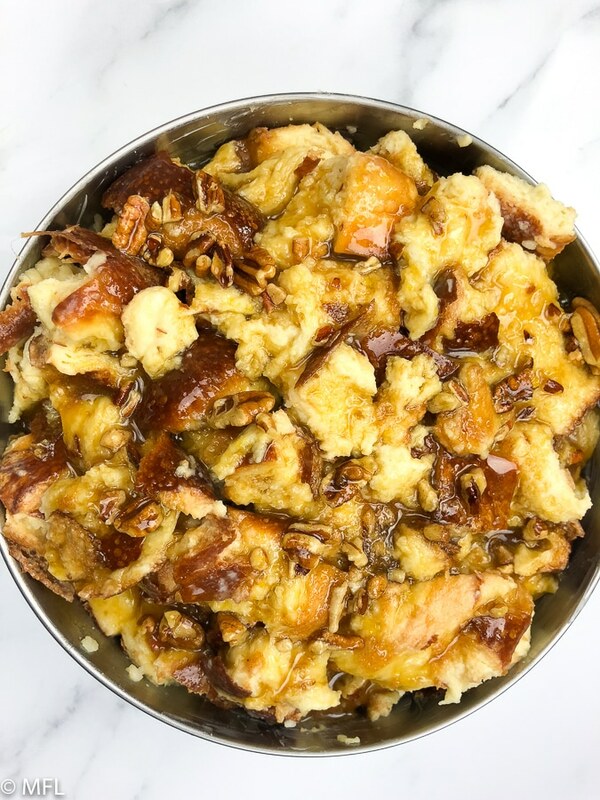 This Instant Pot Bread Pudding with Pecan Caramel Glaze is perfect to make in your Instant Pot. The bread pudding stays moist and delicious and is topped with a sweet and nutty pecan glaze. Place challah bread in a large bowl, set aside. 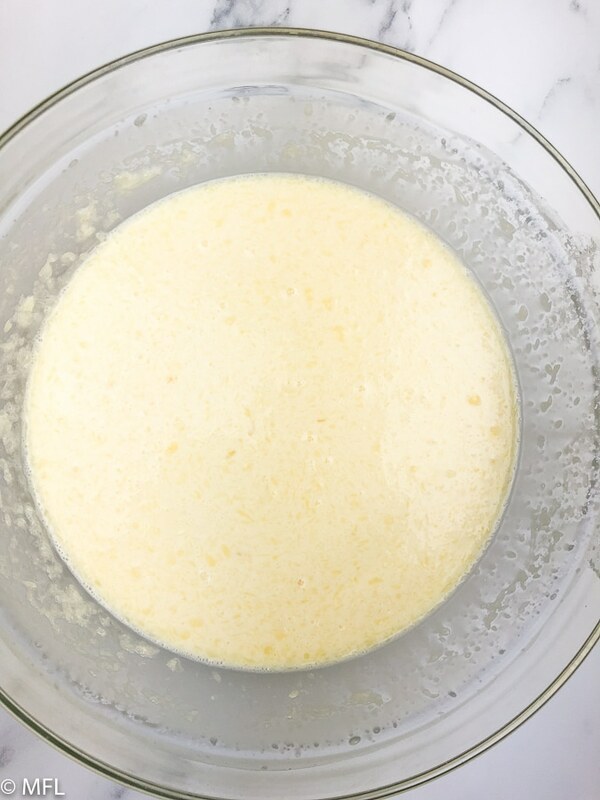 Whisk milk, heavy cream, eggs, granulated sugar, melted butter, and vanilla extract in a medium sized bowl. Pour milk mixture over challah bread and lightly toss to ensure bread pieces are fully covered. Set aside and allow to sit for 1 hour. Whisk together brown sugar, corn syrup, eggs, melted butter, vanilla extract, and pecans. Set aside. Grease a 7 inch bake pan (or springform pan) with butter. Add a layer of your bread pudding base, then a layer of pecan glaze, and so on until the bake pan is full, finishing with a layer of pecan glaze on top. Pour 1 cup of water in bottom of Instant Pot. 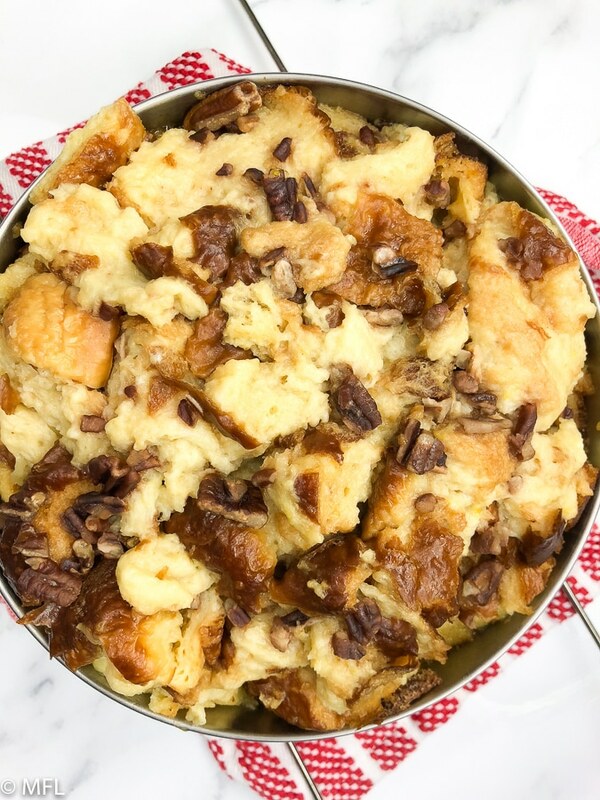 Place bread pudding in Instant Pot with bakeware sling or foil sling on top of trivet. Cover and cook on high pressure for 30 minutes. Allow pressure to natural release for 15 minutes, then manually release any remaining pressure. Remove bread pudding from the Instant Pot and set aside. Place a heavy bottom saucepan over medium high heat. Whisk together butter, brown sugar, corn syrup, heavy cream, vanilla extract, and salt. Allow mixture to come to boil and reduce heat to medium and allow mixture to cook for 5-7 minutes, stirring occasionally. Test your glaze to see if it coats the back of a spoon. If it does, remove pan from the heat. Stir in chopped pecans. Pour caramel glaze over finished bread pudding. Your bread pudding is done when a knife that’s entered into the pudding comes out clean (or mostly clean). To be 100% sure, grab a Quick Read Thermometer and check to make sure the center is 160 degrees. If you can’t find challah, brioche bread works fine. Brioche bread is a tad bit sweeter so you may need to adjust the sugar when substituting. You can serve this recipe with or without the last caramel glaze. I love it with it and think the extra effort in the stove is totally worth it. 7 inch pan. I used the bottom of this steamer insert. I made this wonderful dessert yesterday in my Ninja Foodi using a 400g pkt of brioche for the bread which worked wonderfully. It was done after the cooking time stated and after removing the foil I decided to leave it in the Foodi and use the Grill (Broil) mode for 4 mins until the top was a glorious golden colour. I wish I could post a photo. It came out of the pan easily and I tried a slice pretty much straight away with a small scoop of vanilla bean ice cream and a drizzle of the caramel glaze (without any extra chopped nuts) and it was wonderful. I found after refrigerating for a few hours that it was so moist and delicious that it didn’t need any extra sauce, so next time I wouldn’t make that part of the recipe. Your “steamer insert” suggestion link opens to a type of carpet tape on Amazon. Hi Brenda, Thank you for letting me know. Looks like Amazon changed the links on me. I updated it to another steamer insert that is available. Question- Do you add any water to the instant pot to create steam? Yes. 1 cup of of water into the Instant Pot, and then you add the bread pudding on an insert. My apologies, that step was missing from the instructions. Just added it. Thanks so much for asking the question. Never would have thought to cook it in the instant pot. I am getting into using mine, so this would be good to try. This looks ridiculous and is the first thing that has made my mouth water today…. which is saying a lot because it usually has watered several times by 5 pm. Thank you for sharing. 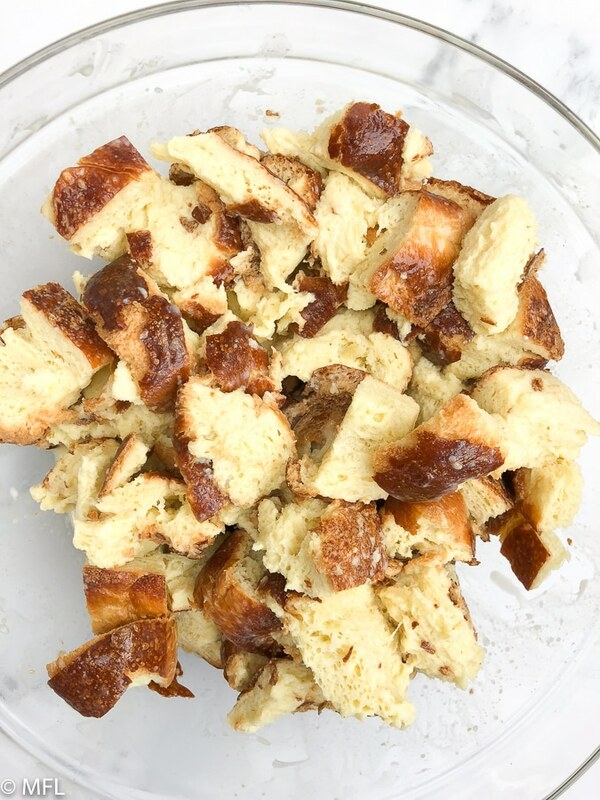 This instant pot bread pudding is genius. This would be perfect for entertaining because it can be cooking while you prep everything else. Oh wow this looks so tasty!!! What a decadent dessert! Bread pudding is a family favorite! 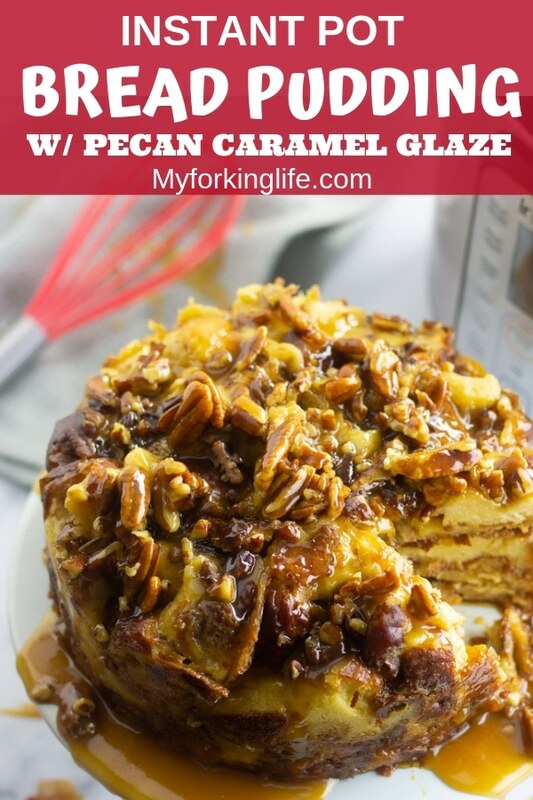 Love the Pecan Caramel Glaze addition definitely need to try that! Why didn’t you cover it with the cover of the steamer pot Instead of aluminum foil? Great question. The bread pudding was too tall to cover with the pot cover so I had to use the foil. I laid it over loosely so that the water wouldn’t drip back down on it while it cooked.